Toyota City, Japan, Apr, 05 2018 - (JCN Newswire) - TOYOTA GAZOO Racing will push the boundaries of hybrid electric vehicles when it takes on the challenge of the 2018-19 FIA World Endurance Championship (WEC) with an evolution of its TS050 HYBRID race car. After a successful pre-season programme which included 21,000 km of running over four three-day tests, the team presented its 2018-19 car at Paul Ricard today prior to the first WEC event of the season, the 30-hour Prologue test which begins at 10am tomorrow and concludes at 4pm on Saturday. The 2018 TS050 HYBRID will take on the challenge of an eight-race WEC season with the clear target to finally overcome the challenge of the Le Mans 24 Hours, which has so far eluded TOYOTA. Mike Conway, Kamui Kobayashi and Jose Maria Lopez will take on that challenge in the #7 TS050 HYBRID while Sebastien Buemi and Kazuki Nakajima are joined by newcomer Fernando Alonso in the #8 car. Anthony Davidson continues to contribute in his role as Reserve and Development Driver. 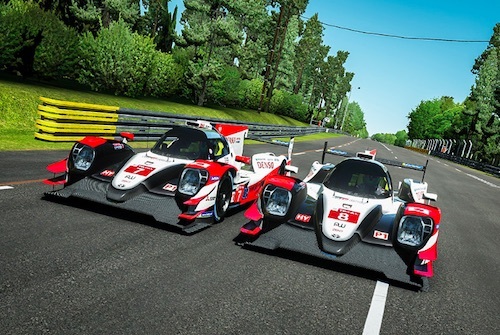 TOYOTA GAZOO Racing may be the only major manufacturer in the LMP1 class but it faces an unprecedented challenge to its hybrid electric technology; the TS050 HYBRIDs must fight for victory against LMP1 rivals who have 69% more fuel energy. New regulations for this season give private LMP1 teams, who do not use hybrid technology, 210.9 MJ per lap of Le Mans compared to the 124.9 MJ available to the TS050 HYBRID, together with 8 MJ of hybrid electric energy. Fuel flow for the TS050 HYBRIDs is also restricted, to 80 kg per hour compared to 110 kg/h for the competition in a further move to strengthen the non-hybrid LMP1 cars, which additionally are allowed to run 45 kgs lighter. TOYOTA GAZOO Racing enthusiastically welcomes the challenge of proving the efficiency and performance of its hybrid electric powertrain in such tough conditions as part of TOYOTA's mission to make ever-better road cars. That mission was highlighted by the GR Super Sport Concept, unveiled earlier this year. The concept car, which has been track tested, incorporates technology developed through the WEC project and is composed of many parts taken directly from the TS050 HYBRID, including the 1,000 hp hybrid electric powertrain and lean burn engine. The TS050 HYBRID has already set new performance and efficiency standards, with last year's fastest-ever Le Mans lap achieved using 35% less fuel compared to the team's 2012 WEC debut. Advancements in powertrain technology contribute to race performance and production car technology. Kinetic energy recovery is a key factor in achieving those improvements, with energy generated under braking harvested by powerful motor/generators on both axles and converted into electrical energy, which is deployed under acceleration to save fuel and deliver performance. That is the same principal which has seen TOYOTA establish itself as the world leader in hybrid electric road cars, selling more than 11 million to date. As part of continuing efforts to develop people as well as technology, road car engineers from Higashi-Fuji Technical Centre will again join the team to enhance their skills. The 1,000 hp hybrid electric powertrain has been modified to strengthen reliability but elsewhere the car is largely the same as that which ended the 2017 season with three consecutive victories. Small but productive improvements to the aerodynamic package have been achieved within the strict homologation rules while the 2018 car features a Gentex rear view camera, displayed on a screen inside the cockpit for the first time. Having ended last season as the fastest car, TOYOTA GAZOO Racing's goal is to finally defeat the unpredictable and arduous Le Mans 24 Hours as it fights for the WEC titles. That challenge begins at Spa-Francorchamps in Belgium on 5 May and concludes eight races later at Le Mans on 15-16 June 2019. "The whole team has worked very hard to be ready for this season and to prepare a fast, reliable car. Thank you to everyone at the GAZOO Racing Company technical centres in Higashi-Fuji and Cologne for their strong efforts. My target is of course the centre of the podium at Le Mans and the WEC title, but our project contributes more than trophies to TOYOTA; we are part of TOYOTA's global effort to make ever-better cars. We started the racing hybrid project in 2006 and at that time we learned a lot from road cars. After that we developed our own racing hybrid electric technology in WEC and we have learned a lot. Our next stage was to send back this know-how and technology into road cars and we are all particularly proud to see how our efforts in WEC are contributing to TOYOTA's future road cars, most visibly with the GR Super Sport Concept car. Our mission is to succeed on the track and deliver technology for future road cars; endurance racing is the perfect environment for this." "We are all excited about the coming season, which is unique in many ways. To have two Le Mans in one season is something really special and we hope that by bringing Fernando to the WEC, we are contributing to the growth of the championship. Additionally, the regulations this year have set us a challenge like no other. We have demonstrated since 2012 that our hybrid electric powertrain delivers real performance and efficiency benefits; now we must be more efficient than ever to beat our LMP1 rivals, who have significantly more energy, more fuel flow and less weight. We thrive on challenges like this as they push us to make ever-better cars. But make no mistake, we hate to lose so our target could not be clearer; victory at Le Mans and the WEC title." "Unlike previous years, the upgrades on our 2018 car are limited. In addition to reliability improvements on the powertrain, we updated the cooling system and developed the bodywork within our 2017 homologation. In terms of outright performance, in the past four years we have had a car fast enough to win Le Mans on three occasions, with no fundamental reliability issues. Nevertheless we failed every time to win so we had to do something about it. In Le Mans you can expect that 30-40% of race circumstances will be beyond your control; this is the beauty and at the same time the horror of Le Mans. So we have largely changed the way we are preparing for the race this year, focusing more on unconventional race situations. We always have to improve and there was room for improvement to reach our obvious targets." "I feel good coming into the season. It's going to be a challenging one but I hope we can win a lot of races. I hope and believe we have the package and the team to succeed. The ultimate aim of course is to win Le Mans but we know from painful experience how hard this race is; 24 hours is really tough. The design team has been working on every millimetre of the car to be sure it as light, fast and reliable as possible, plus the mechanics, engineers and drivers have been preparing to handle unexpected events. The target is to find lap time and enhance reliability. So far I am feeling confident but there's a long way to go." "Our car has evolved since last year; we know what it is capable of and we are pretty confident in the performance and reliability. Clearly we have learned from the past so we know what we need to do and this helps our confidence. We need to win Le Mans and win the championship as well; with TOYOTA as the only LMP1 manufacturer these can be our only targets. But in June we know that we are racing against Le Mans as much as any other competitor, so we are doing a lot of work for this special race, which is really unlike any other. I believe we are ready and I am looking forward to an interesting, hopefully successful, season." "I feel great ahead of the new season. As always it is a fresh start and it is exciting; we have new expectations, new goals. My targets are the same as the team targets although we know it is a different year. We have been working hard and the main objective is Le Mans; we hope this year to arrive strong and to make it happen. Le Mans is very special. Of course I am relatively new in endurance but I could experience some of it last year and it was amazing. The TS050 HYBRID is an incredible car and the team has spent the last months preparing as always with a lot of effort, trying to make it even stronger." "I feel very good and I can't wait to race again. Le Mans is our biggest race of the season and we have worked on so many different aspects to be hopefully ready for anything. In 2013 I finished on the podium in my second Le Mans and I thought maybe it is not that hard to win. But we have had a competitive car for the past few years and I learned Le Mans is very difficult to win. WEC looks like a great challenge as well this year with 10 LMP1 cars. We don't know what the other teams can do performance-wise so we are focusing on ourselves. There is only one target: to win. I am looking forward to this challenge." "It is always exciting to drive this hybrid LMP1 car. Hybrid might sound gentle or economic but the hybrid we have on the TS050 HYBRID provides a lot of excitement and is very powerful. Le Mans has been a big aim for us as a team and for TOYOTA as a manufacturer for a long time. We know there is a good chance to win but as we have experienced before, there will be a lot of drama in the race. We have to focus on the preparations because the challenge of Le Mans is to complete the race without any technical or human error. It is a tough challenge and we have not managed to do that many times up to now so that is the first priority." "To race on the best circuits in the world like Le Mans, and with one of the best teams like TOYOTA, is a privilege and a dream come true for me. The car is amazing; something very special. The technology that the LMP1 hybrid cars have was unthinkable a few years ago. Thanks to the team, the performance should be there because they have the experience of Le Mans and WEC. I think I am in the right place with the right team. I'm very excited about this project. I cannot wait for June but I know before this big event I need to do testing, simulator work and the race at Spa because I need to respect Le Mans. I will be fit, prepared and ready."